A man has pleaded guilty to sending “threatening” emails to seven MPs. Jarod Kirkman, 51, used a fake email address to target a cross-party selection, including ex-Conservative cabinet minister Nicky Morgan and Labour’s Yvette Cooper. Kirkman, of Torquay Drive, Luton, admitted sending malicious communications at Westminster Magistrates’ Court on Monday. The messages were sent between 4 December and 21 January, police said. 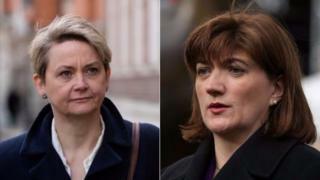 Prosecutors said malicious emails were sent to Labour MPs Ms Cooper and Jenny Chapman, Conservative Ms Morgan, former Tory Nick Boles, as well as Sarah Wollaston and Heidi Allen of the Independent Group. Kirkman also pleaded guilty to a charge of racially or religiously aggravated intentional harassment against Labour MP David Lammy. Ms Morgan said: “I am very grateful to the police for how seriously they took this matter. Det Insp Craig Laws, of Bedfordshire Police, said: “We have a duty to take all threats seriously, including those made to Members of Parliament. Kirkman will be sentenced on 18 April.